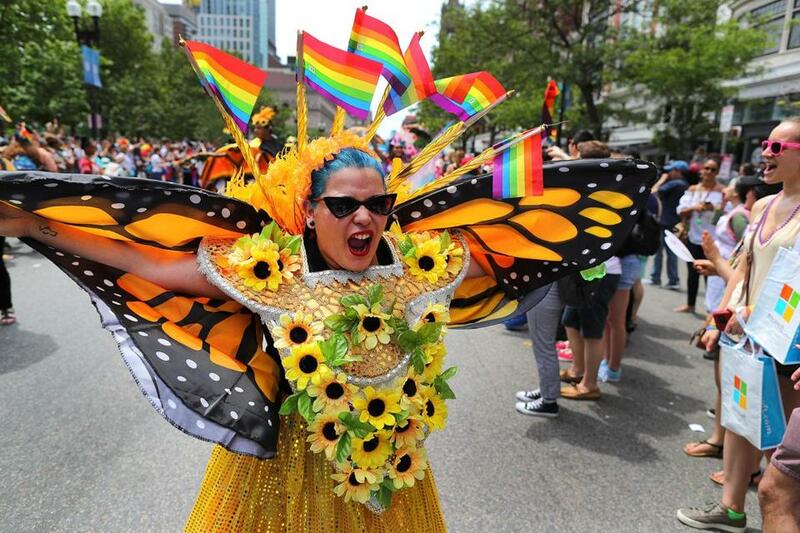 A woman in a butterfly outfit walked down Boylston Street during the Boston Pride Parade. Thousands of people lined city streets Saturday to cheer on the Boston Pride Parade, an event that combined a party, a protest, and a celebration of the city’s LGBTQ community. The parade, now in its 48th year, took on special urgency this year. Despite advances in the struggle for equality for the nation’s LGBTQ community, including the hard-won right to marry, advocates worry that President Trump’s administration’s rollback of protections for LGBTQ Americans — such as barring transgender people from serving in the military — will erode the community’s civil rights. Trump, who during the 2016 election pledged to “fight” for the community, has yet to recognize June as LGBTQ Pride Month, as did former presidents Bill Clinton and Barack Obama. What was generally a joyful day was marred by a crash Saturday afternoon that involved a pedestrian and two Boston police officers. A woman in her 80s was hospitalized, along with the officers, after the officers’ motorcycles clipped each other and hit her near the corner of Beacon and Joy streets at 3:24 p.m., said Officer James Kenneally, a Boston police spokesman. The two motorcycle officers were responding to a call for help from a fellow officer, Kenneally said. “They came into contact and clipped one another, and as a result of that, one of the officers came into contact with the pedestrian,” Kenneally said. Police Commissioner William Evans told reporters at the scene that the officer who called for help had suffered heat exhaustion while working at the parade. Evans said that investigators did not believe speed was a factor in the incident. Witnesses told WCVB-TV that parade spectators helped assist the injured woman and officers, and that the woman lost consciousness. “We have the same bodies, same bones ... we are all human,” Lipps said. The political divide over LGBTQ civil rights was on dramatic display Saturday: While federal officials look to walk back protections, about 100 mayors from around the country marched alongside Boston Mayor Martin J. Walsh at the parade’s start. When the mayors, who were attending the United States Conference of Mayors meeting in Boston, joined the parade at the corner of Clarendon and Boylston streets, the crowd let off a rousing cheer and applause. 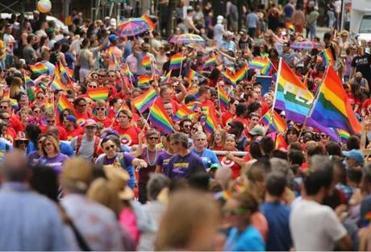 Each mayor wore a rainbow sash draped over his or her shoulders. Among them was Mayor Tammy Dana-Bashian, from Rowlett, Texas, a small city near Dallas, who said inclusion is “absolutely critical” for local cities. A group of mayors also attended a Pride luncheon for seniors on Friday, Walsh said. “It’s a way to showcase our city,” Walsh said. Boston’s mayors have a tradition of walking in the Pride Parade: Mayor Thomas Menino was a “pride marshal” for the event, and Mayor Raymond Flynn also marched in it. In the past, politicians who joined the parade were “taking a chance by doing it,” said one parade-goer. Senator Elizabeth Warren marched with singer-songwriter Melissa Etheridge, who posted a short video to Twitter as she walked along the parade route and praised Warren. “She gets the respect she deserves from the community!! Today I was the supporting act,” Etheridge wrote Saturday afternoon. This year’s parade theme was “Rainbow Resistance,” a message intended to be “against the oppression and backwards policies of the current administration” that affect communities of color and transgender people, according to a statement on Boston Pride’s website. The theme included a protest against an upcoming Massachusetts ballot question that will ask voters in November to roll back protections for transgender people to have equal access to public facilities. Even with the nation’s politics in the background, parade day in Boston was mostly a high-spirited event. Cheering paradegoers packed the route, which began at Copley Square, traveled through the South End, and ended with a festival at City Hall Plaza, while the marchers hoisted rainbow flags and banners, blew whistles, or rode floats along the parade route. Here and there, a marcher would stop and offer a well-wisher a hug, or a well-timed high-five. Derick Reed, 23, of Somerville, said authorities and businesses wouldn’t participate in a Pride event back in his native Brazil. Reed, who was with his husband, Ryan Reed, pointed out a Boston police officer wearing a rainbow ribbon, his arm around a parade-goer. “It’s amazing feeling of safe and sound” here, he said. Morad Elhafed, 36, sat on a doorstep along the route with his daughter, Mia, 4, and son, Kenz, 1, as the two children excitedly waved rainbow flags. “People come out, they’re happy, they’re celebrating peacefully,” Elhafed said, pausing for a moment to point out a float representing Mia’s school cruising down the street. “I like the parade,” Mia said, holding a small version of the flag that was a common sight along the the route. Reynolds, who marched in the parade, hoped the event would help bring people together. John Hilliard can be reached at john.hilliard@globe.com. Lucas Phillips can be reached at lucas.phillips@globe.com.